Frequently asked questions about the voyage to Gaza to break Israel's naval blockade on the area. 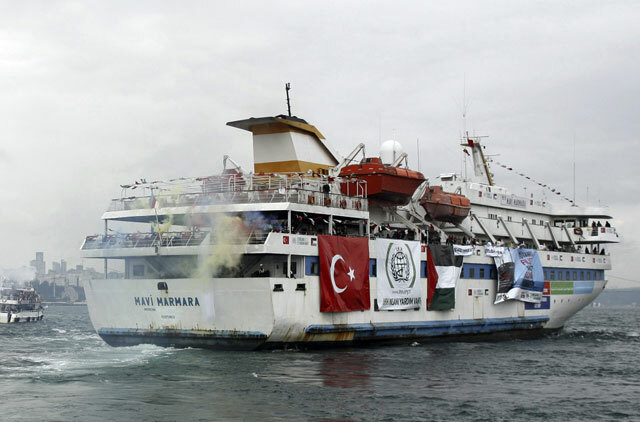 What is the “Freedom Flotilla” and why is it going to Gaza? The Freedom Flotilla is a coalition of aid organizations that aim to deliver aid to the Gaza strip, which has been blockaded by Israel and Egypt since June 2007, when Palestinian Islamic resistance group Hamas took control of it. Israel controls the crossings into Gaza from its own territory, as well as its air space and territorial waters, and Egypt controls the sole crossing into its territory at Rafah. This has prevented many essential items required by the 1.5 million people that live in Gaza from getting in, such as medical equipment, stationary, food items, and even toys. A number of aid organizations have referred to the blockade as “collective punishment” for the people of Gaza. The Freedom Flotilla will attempt to breach the sea blockade of Gaza and deliver such items. What exactly will the flotilla be delivering to Gaza? It is taking construction materials such as cement and iron, generators, ultrasound machines, dentist chairs and equipment, blood testing devices, electric wheelchairs and toys. The cargo will be scanned at every port it calls at before reaching Gaza to ensure that it does not constitute a threat to Israel. How many passengers and how much cargo will the flotilla include? Nine vessels: four for cargo and five for passengers. There will be at least 10,000 tons in cargo, and up to 800 people from more than 40 countries on the flotilla. Aid groups from Sweden, Ireland, Greece, Turkey and Malaysia have been involved. Among the passengers are journalists, lawmakers, activists and civilian volunteers. Has the flotilla been endorsed by any position of authority? The Turkish government and prime minister have expressed support for the flotilla, and the Director of Operations of the UN Relief and Works Agency for Palestine Refugees (UNRWA) in Gaza, John Ging, has called for the international community to “break” the siege on Gaza by sending ships. The Irish ambassador in Israel has also expressed support, asking Israel to ensure that all the aid arrives in its destination and Irish citizens not be harmed. The Free Gaza Movement, one of the organizing groups which attempted such trips eight times before, has endorsements from Arshbishop Desmond Tutu and Noam Chomsky among many others. Has such a campaign been attempted before? The Free Gaza Movement, one of the coalition partners, started the campaign in August 2008, sending two boats in August 2008. These were the first international boats to land in the port in 41 years. It has since attempted to break the blockade seven times but the last three times have been blocked by Israel. The latest attempt, with the Freedom Flotilla, differs in that it is significantly larger and has many more passengers. Will Israel allow the vessels to enter? Israel controls Gaza’s territorial waters, and has warned campaigners not to attempt to break the blockade, saying it will use “any means necessary” to stop the flotilla. Israel has, in the past, stopped the flotilla by ramming it with gunboats, towing it to its own ports as well as taking in passengers from international waters and detaining them. The Israeli navy has reportedly been conducting practice exercises in order to block the Freedom Flotilla. Organisers have said they are undeterred and are determined to continue. The presence of high profile personalities on the ships gives the campaigners leverage over Israel, but the state has not hesitated to imprison prominent people in the past, including former congresswoman and US presidential candidate Cynthia McKinney. Some of the vessels will be flying the Turkish flag. If such a vessel is attacked in international waters, a major diplomatic incident could follow. Why does Israel not allow the vessels to enter? Israel claims that some of the aid material that is being carried by the vessels could pose a threat to its security, and strengthen Hamas, which controls the Gaza strip. The cement, for example, could be used to build bunkers for Hamas’ leadership, it has argued. The United Nations Development Program has said that up to 75% of the damage caused by Israel’s 2008-2009 war there remains unrepaired. Does Israel have a legal argument in blockading the Gaza Strip? Following Israel's unilateral disengagement from Gaza in August 2005, where the military and settlers left the strip, the Israeli supreme court ruled that the territory was no longer occupied, however the international community has not accepted that status. In September 2007, Israel declared Hamas-ruled Gaza a "hostile entity", reserving the right to blockade the strip and conduct military activities there under the pretext of security. After the December 2008-January 2009 Israeli war on Gaza, the Israeli Defence Forces began enforcing a naval blockade of Gaza for 20 nautical miles, thus blocking all routes of access into Gaza. Since then, no aid ships have been allowed to enter Gaza's waters. In justifying its actions in Gaza's territorial waters, Israel is also likely to cite the Gaza-Jericho agreement of May, 1994. Under the agreement between the Palestinian National Authority and Israel, part of the Oslo Accords, Israel reserved the right to patrol 20 nautical miles of those waters "without limitations" and take "any measures necessary against vessels suspected of being used for terrorist activities... or for any other illegal activity". Palestinian Canadian lawyer Diana Buttu however says that Israel declared the Oslo Accords dead in 2001, and has already breached the agreements, thus diminishing the plausibility of that argument.